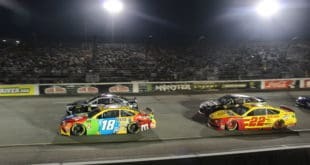 As NASCAR moved to the Las Vegas Motor Speedway this weekend, we were treated to a triple-header of the top three national touring series for the third consecutive week. Vegas has the feel of a town where the underdog can rise. Your last dime could turn into millions with a roll of the dice or a spin of the wheel. But while the garage may be neon, it’s a lot harder to get lucky there than at any roulette wheel on the strip. 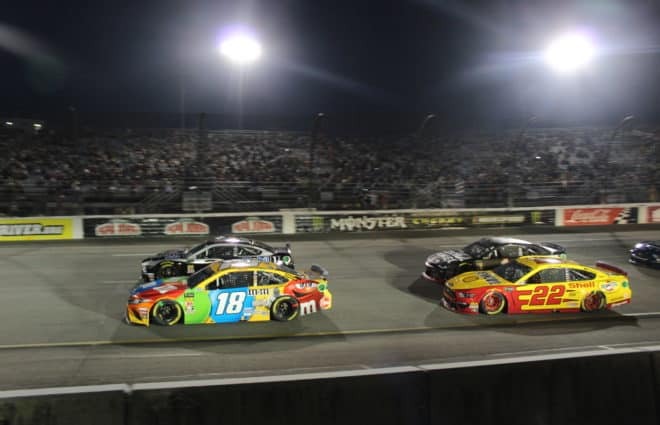 As one of the more traditional mile-and-a-half speedways that populate the schedule, the gap between the haves and the have-nots is pronounced. Michael McDowell was the first to make some noise this weekend. 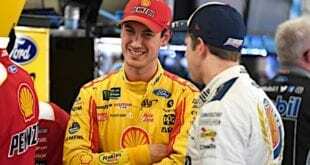 His Front Row Racing Ford was ninth quickest in the first round of practice on Saturday. 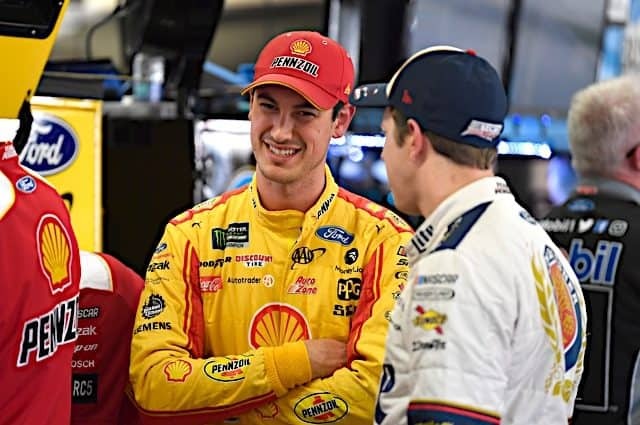 For a driver who only had one finish better than 29th at Las Vegas coming into the weekend, it was both surprising and promising. McDowell backed it up in qualifying as well. His 15th place start was far and away tops among the small team warriors. Additionally, McDowell’s teammate David Ragan showed similar speed. Ragan qualified 23rd for the second consecutive week. 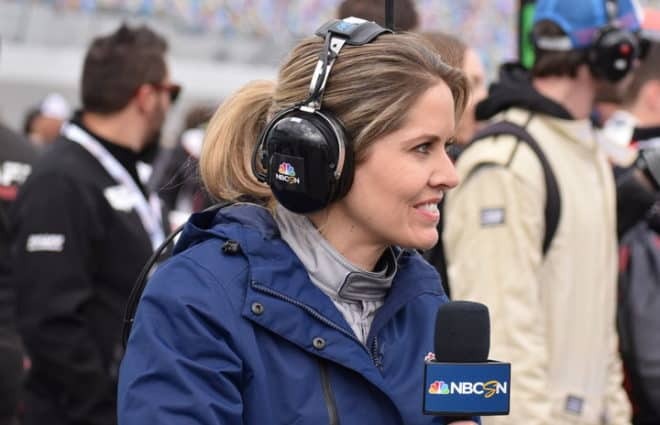 But when the checkered flag waved, there were no underdogs on the lead lap in Sunday’s rundown for the second straight race. Kevin Harvick taking the field to school yet again tends to enhance the difficulty of that, so maybe that isn’t the best gauge. Either way, Chris Buescher was the top dog in Vegas, scoring a 15th-place finish. Buescher has been quite a surprise thus far in 2018, as he is currently 16th in points. He finished fifth in the Daytona 500, his first top five since August of 2016 at Bristol. The No. 37 seems primed for a breakout season and the team is off to a solid start. Kasey Kahne was next up in Vegas, finishing 19th for Leavine Family Racing. Kahne ran mid-pack most of the event, gaining two positions overall from where he began the race. Behind Kahne’s Chevrolet was the biggest surprise of the race, Matt DiBenedetto. DiBenedetto moved up 10 spots from his starting position to finish 22nd. 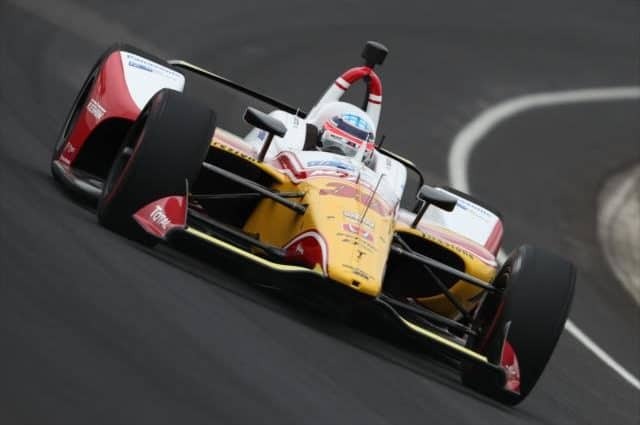 It is the best finish for the GoFas Racing driver on a non-restrictor plate track since he came home eighth at Indianapolis last summer. Vegas was the first race for DiBenedetto with new crew chief Randy Cox after the departure of longtime crew chief Gene Nead. Time will tell if the pairing will continue to enjoy similar success, but the group is clearly off to a great start. Ty Dillon followed Ragan across the line in 24th. Right behind Dillon was Cole Custer, who made his first career Monster Energy NASCAR Cup Series start for Rick Ware Racing. Custer kept the car out of trouble and brought it home 25th. The finish was the best for Rick Ware Racing outside of February’s Daytona 500. Cole Whitt and Ross Chastain came in 28th and 29th respectively. 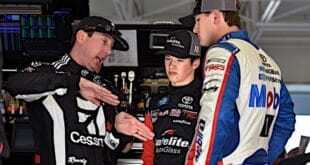 Buescher’s JTG Daugherty Racing teammate AJ Allmendinger didn’t quite enjoy the same level day as his stablemate. Allmendinger staggered home in 30th position. 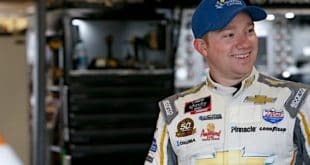 Allmendinger was followed by StarCom Racing’s Jeffrey Earnhardt in 31st. Behind Earnhardt was Joey Gase in 32nd and Gray Gaulding, who, along with McDowell, was the only other underdog with a DNF in 33rd. Canadian driver Stewart Friesen once again turned heads in the Camping World Truck Series race for all the right reasons. Friesen led twice for a total of 31 laps and was in contention for the win all night. He not only kept up with the leaders but was capable of passing them often. Friesen’s fifth-place finish has him looking like a reasonable threat to visit victory lane at some point in 2018. Making his outside pole and top five run even more remarkable is the fact that Friday was only the 28th start for both driver Friesen and owner Chris Larsen. Equally impressive was the run of 20-year-old Justin Fontaine. Fontaine, who drives for Niece Motorsports, made just his sixth truck start this weekend. He finished ninth, already his second career top 10. Fontaine also led two laps and was actually the driver that eventual winner Kyle Busch passed to take the top spot for the final time. Enough runs like that one and Fontaine won’t be considered an underdog for much longer. Absolutely surreal, 2 top tens in 3 races!!!! @NieceMotorsport took a chance on me this season and I couldn’t be more proud to represent them as well as @SuperiorEssex this year! Thank you to everyone who’s stuck with me all this time! !